Born April 15, 1889 and growing up in Neosho, Missouri only several decades after the Civil War, Thomas Hart Benton remembered many stories of Union and Confederate veterans and the old settlers from the hills of the Ozarks. These characters made for colorful tales in the isolated little town. Handwritten notes that were to comprise Dwight Kirsch’s autobiography were found in his desk drawer after his death in 1981. Entitled “My Life in Art – Memoirs,” it unraveled a story about an artist, teacher, and art administrator whose importance to art in Nebraska cannot be underestimated. 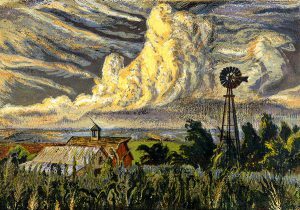 Dwight Kirsch’s legacy to Nebraska combined his own body of Regionalist art and many important examples of early modern art that he purchased on behalf of the Nebraska Art Association (NAA) for the University of Nebraska Gallery. The collection he built would later become the foundation of the Sheldon Museum of Art. A combination of his foresight in the arts and the economic challenges of the Depression era allowed him to make contact with and collect works by many artists that would have otherwise been hard-pressed to bring their work to Lincoln, Nebraska. Dwight Kirsch was first exposed to the arts at an early age and it would remain a driving force all his life. Born near Mayberry, Pawnee County, Nebraska, his first watercolors were done at the age of 6. By age 10, Kirsch began experimenting with photography and was developing his own prints. He entered the University of Nebraska, Lincoln, when he was only 16. Even then, the University was a proving ground for some other promising artists such as Aaron Douglas and Leonard Thiessen. Kirsch graduated in 1919 and moved on to the Art Students League in New York. The move to New York and its artistic climate, still feeling the wake of the important 1913 Armory Show, must have been exciting. The Art Students League was a student-controlled, progressive school where Kirsch was allowed more freedom for growth. While there he attended lectures by fellow Nebraskan Robert Henri. At the same time, he became familiar with commercial art and advertising while apprenticed to the Niagara Lithograph Co. His apprenticeship with Niagara was followed up with a two-year stint with the John B. Holtzclaw Co. in Los Angeles. His role shifted from student to teacher in 1924 when he accepted a teaching position at the University of Nebraska. The F. M. Hall Trust was established in 1929 for the purpose of purchasing art for the University’s gallery through the NAA. Ten thousand dollars was available to the NAA every year for that purpose. Initially, art exhibitions were secured through the Art Institute of Chicago, but this practice changed in 1932 due to mutual concerns of faculty and NAA members over the artwork that was being selected. Adding to his responsibilities for selecting and installing these works in the University galleries, Kirsch became the NAA secretary in 1933. By 1936, he was Chairman of the NAA’s Exhibition Committee as well as the University’s gallery director. Prior to this time, outside jurors had been used to select new acquisitions, but now Kirsch accepted the task of meeting the artists and making those selections himself. On his many trips to New York, Kirsch came into contact with a number of America’s most important artists of the early 20th century. His focus on contemporary art acquainted him with Edward Hopper, Thomas Hart Benton, Alfred Stieglitz, Andrew Wyeth, John Sloan, and others. These trips also brought him recognition not only as an artist in his own right, but also as an art authority and public speaker. Kirsch was also responsible for bringing many important artists and their work to Nebraska. Georgia O’Keefe and Walter Kuhn exhibited in Lincoln in 1939. He invited Grant Wood and John Steuart Curry to lecture. He worked with photographers Stieglitz and fellow Nebraskan Wright Morris, and even invited Morris to Atkinson, Nebraska, where the family of Dwight’s wife lived. In 1946, he procured works by Salvador Dali, Henri Matisse, Pablo Picasso, Marc Chagall, and Pierre-Auguste Renoir for the European section of an NAA exhibition. That year private purchases by donors allowed for several important acquisitions. This was the pattern through the 1930s and ’40s until he accepted a position at the Des Moines Art Center in 1950. After a year as the interim director, he accepted a full-time position that lasted until his retirement in 1959. In 1953, his wife, Truby, died. Shortly thereafter, he was granted an honorary doctorate from Iowa’s Grinnell College. While continuing his work in Des Moines, he also traveled extensively. As always, Kirsch traveled to New York and to other art centers for both business and for his own education. He visited Mexico both shortly before and shortly after leaving Nebraska. Through the 1950s, he would travel through the Midwest and visit Colorado, California, and Arizona where he advised a fledgling art center in Phoenix. Probably his most important trip was to the East where he studied sumi-e painting in Japan and also toured Hong Kong, Singapore, Cambodia, Den Pasar, Bali, and Indonesia. After retiring from the Des Moines Art Center, he remained active through lectures, workshops, commissions, and artist-in-residency programs. Kirsch exhibited works both in Nebraska and Iowa, and also Colorado. He kept traveling and remained deeply involved in the arts. He moved to Colorado to be near his family in 1976. Among many other honors he had received over the years, he was given a joint retrospective exhibition by the Sheldon Memorial Art Gallery (now Sheldon Museum of Art) and the Des Moines Art Center, both for which he had done so much. Dwight Kirsch died in 1981 at the Colorado State Veterans Home, Colorado Springs. The Museum of Nebraska Arts holds 29 works by Dwight Kirsch.